I'm not heading to London Fashion Week this year but I have to say I very much enjoy reading these types of post! Rather than the usual here's a snap of my bag, I thought I would shake it up and just narrate what was and would be with me if I was taking the trip to the capital this weekend. Firstly, I think everyone and anyone can head to London Fashion Week - even if you aren't gracing the frow of a show it doesn't mean you can't soak up the atmosphere just like everyone else. I actually think that can be the best bit! A lot of brands and companies use the opportunity of the city being busier than ever to provide pop up events and services, sometimes discounts so there is always something fun to get involved in and look at. When I headed down to LFW a couple of years back, I purely went as I was invited to the Handpicked Media Blogger Suite. I was invited to a couple of shows but they were on the Monday and I was only there for the weekend.. ah well, it wasn't meant to be! However, should an opportunity drop into your inbox like the Handpicked Media one did for me, I would honestly urge you to take it if you have the resources to do so! I was lucky as I had a bit of money back then so on a whim I decided to go to London, stay in Shoreditch for the night and do a bit of LFW stalking. 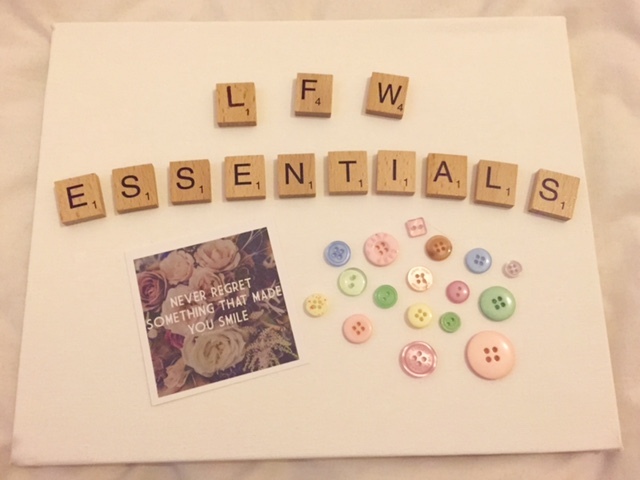 I was able to connect with some of my favourite brands and I genuinely look back on the weekend very fondly as an event that I have checked off my to-do list! Somerset House is absolutely buzzing and whilst all the activity isn't there, the most part is and it is unrivalled in terms of people spotting. You never know you may just spy your favourite bloggers and celebs there too! Charger(s) I found a fab backup charger for my iPhone on Amazon that you can use to get two/three full charges from so it's ace if your start to lose juice.. Oyster Card/Tube Ticket/Taxi Fare - getting to Somerset House is fairly easy so I'd just ensure you have a variety of ways you can get there and back out again, there are plenty of taxis around but if budget is limited then the tube is really very easy. Depending on what you want to achieve from visiting LFW you may or may not need a notepad. I didn't use mine when I went, I used the notes function on my iPhone and collected bits and bobs of info within there. Business Cards - If you don't have business cards then seriously don't fret. You may only give one or two out at the very most and really that's only if you are heading to events and brands are there. I did take some with me and it was easier than reeling off my email address but please don't feel inferior if you don't have any because you certainly won't look that way! Flat or low heeled shoes - I have news for you. Somerset House and the surrounding area is cobbled. Which means walking in heels is a pain.. all well and good for celebs who are making a beeline from taxi to show but for those of you wanting to wander around, it's worth bearing in mind as you don't want to ruin your experience by being uncomfortable. Toiletries and makeup - mini deodorant, perfume, a bit of makeup to touch up will all be welcomed, trust me. I was lucky and had my makeup done by Bourjois when I went to LFW but in the hustle and bustle, and especially if it's a warm day you will want to just make sure you are looking as lovely as when you first arrived all day. Confidence - this is something I probably didn't have that much of at the time but would really urge anyone wanting to go, to try and summon. Listen to me when I say, you have every right to go to Fashion Week. Before I started blogging, LFW was almost a mythical special event that only really cool people got to attend. Stuff that. If you want to go then go! Hold your head up high and even if its just you on your own (like I was) then you go and enjoy it! Hell, go get a blow dry and own it!!! A spare tote bag or roomy bag - freebies are rife at LFW so milk it and make sure you have room to house any bits you are given!